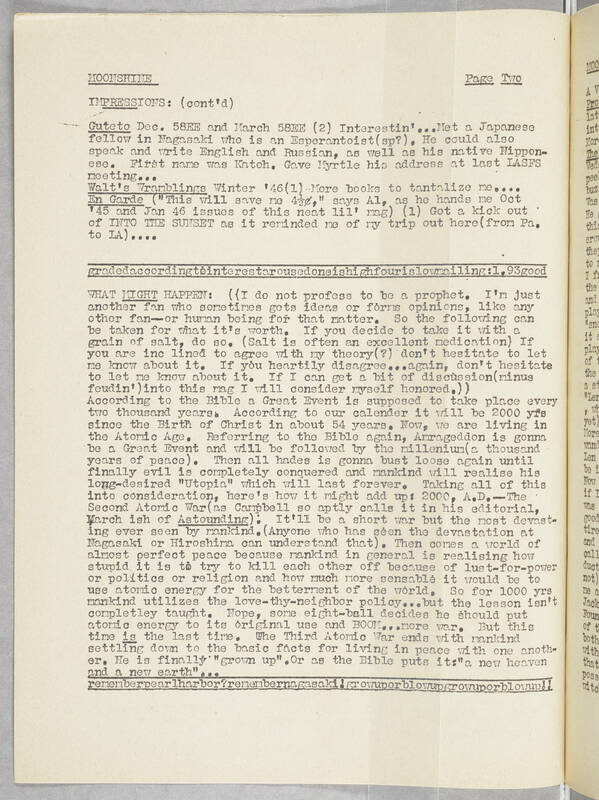 MOONSHINE Page Two IMPRESSIONS: (cont'd) Guteto Dec. 58EE and March 58EE (2) Interestin'...Met a Japanese fellow in Nagasaki who is an Esperantoist (sp?). He could also speak and write English and Russian, as well as his native Nipponese. First name was Katch. Gave Myrtle his address at last LASFS meeting... Walt's Wramblings Winter '46 (1) More books to tantalize me... En Garde ("This will save me 4 1/2 cents" says Al, as he hands me Oct 45 Jan 46 issues of this neat lil' mag) (1) Got a kick out of INTO THE SUNSET as it reminded me of my trip out here (from Pa. to LA).... gradedaccordingtointrestarousedoneishighfouris lowmailing:1, 93 good WHAT MIGHT HAPPEN: ((I do not profess to be a prophet. I'm just another fan who sometimes gets ideas or forms opinions, like any other fan--or human being for that matter. So the following can be taken for what it's worth. If you decide to take it with a grain of salt, do so. (Salt is often an excellent medication) If you are inc lined to agree with my theory (?) don't hesitate to let me know about it. If you heartily disagree...again, don't hesitate to let me know about it. If I can get a bit of discussion (minus feudin') into this mag I will consider myself honored.)) According to the Bible a Great Event is supposed to take place every two thousand years. According to our calender it will be 2000 yrs since the Birth of Christ in about 54 years. Now, we are living in the Atomic Age. Referring to the Bible again, Armageddon is gonna be a Great Event and will be followed by the millenium (a thousand years of peace). .Then all hades is gonna bust loose again until finally evil is completely conquered and mankind will realise his long-desired "Utopia" which will last forever. Taking all of this into consideration, here's how it might add up: 2000, A.D.--The Second Atomic War (as Campbell so aptly calls it in his editorial, March ish of Astounding): it'll be a short war but the most devasting ever seen by mankind. (Anyone who has seen the devastation at Nagasaki or Hiroshima can understand that). Then comes a world of almost perfect peace because mankind in general is realising how stupid it is to try to kill each other off because of lust-for-power or politics or religion and how much more sensable it would be to use atomic energy for the betterment of the world. So for 1000 yrs mankind utilizes the love-thy-neighbor policy...but the lesson isn't completely taught. Nope, some eight-ball decides he should put atomic energy to its original use and BOOM...more war. But this time is the last time. The Third Atomic War ends with mankind settling down to the basic facts of living in peace with one another. He is finally "grown up". Or as the Bible puts it: "a new neaven and a new earth"... rememberpearlharbor?remembernagasaaki!growuporblowupgrowuporblowup! !